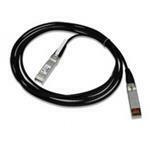 Allied Telesis AT-SP10TW products are available in 1, 3 or 7 meter lengths. The passive SFP+ direct attach copper cable assembly is a low cost alternative for short reach applications. Additionally, the copper cable acts as a natural heatsink. The low power consumption assists in making the passive copper cable assembly an economic solution for within rack or rack-to-rack applications.